The current world population of 7.3 billion people is estimated to reach 9.7 billion by 2050. Around 83 million people are added to the global population each year. This growth must be met by corresponding increases in food production. Compared to current yields, agricultural output would have to grow by at least one third to keep up with food demand. Because farm land acreage can’t keep up with population growth, farmers have started to transition their operations to precision agriculture. At its core, precision agriculture is deploying intelligence to fields so that farmers can gain visibility into crop yields and cost factors as they grow crops. Intelligence is collected by smart devices or IoT things equipped with sensors that continuously act on the data and transmit it to data processing locations. Today, farmers are using newly developed techniques to manage crops on micro portions of their fields to assess soil composition, control fertilizer and pesticide types, and obtain accurate yield estimates. Precision farming would not be possible without IoT-driven solutions because they speed up farmers’ understanding of the main causes for changes in crop yields and factors that affect the measured yields and production cost drivers, including the following. Fertilizers and their application timing and methods. Air temperature and moisture levels. Measuring and collecting field, crop, and ambient data are key capabilities enabled by mature IoT solutions. Most farms are in remote locations where data network connectivity can be spotty. Frequent weather fluctuations can cause damage to or loss of sensors and devices. These types of challenges require robust, simple, and easy to manage IoT solutions. Yanmar is a Japanese company that specializes in diesel engine design and manufacturing. 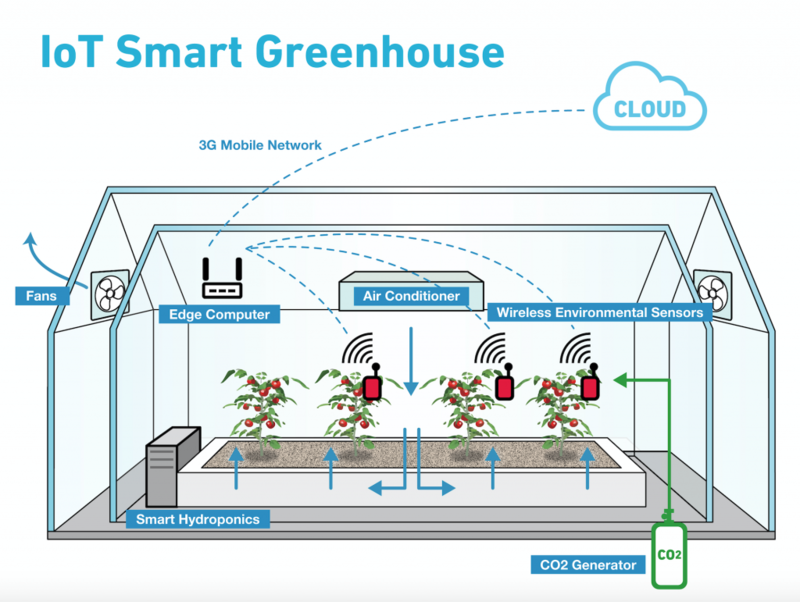 Its presence in smart farming includes actively managing plant growth in greenhouses. One of their challenges is administering the right amount of water (smart hydroponics) and environmental support, including fans and air conditioners, for greenhouse plants, such as tomatoes. Yanmar’s R&D group would like to make their greenhouse operations smarter by automatically detecting and recognizing the main growth stages of vegetables in order to adjust nutrition, care, and environment to maximize yields. Yanmar has defined several growth stages for tomato plants. To monitor these stages, they plan to install up to 12 cameras in each greenhouse to take pictures of the plants on a regular basis. Yanmar plans to use machine learning (ML) algorithms deployed on the camera ecosystem to recognize (by height, number of leaves, number of flowers, and fruits) plant growth stages and perform attribution against plant care factors, such as hydroponics application patterns and frequency, in addition to moisture and temperature. Pictures from the smart cameras will be used to regularly monitor, recognize, and count plant leaves, flowers, plant height, and to calculate predicted greenhouse yields. Optimizing greenhouse operations by effectively using the appropriate inputs of nutrients, water, and other elements at the most appropriate plant stage growth makes greenhouse farming more economically and environmentally sustainable. The amount of data generated by the cameras. The bandwidth and cost required to transmit the data for processing off-site. Access to image recognition intelligence on the cameras. Yanmar’s R&D group decided to deploy AWS Greengrass ML Inference using Lambda functions, on the greenhouse camera ecosystem because it addresses the following key challenges. First, Yanmar does not need to send the pictures collected from the cameras to AWS IoT Core over a 3G network, thereby avoiding 3G usage fees. Second, Greengrass accesses trained and deployed deep learning ML models to process greenhouse plant pictures and store the data in a simple format for transmission to AWS IoT Core. Third, Yanmar plans to use Lambda functions to perform logic processing using local ML models to detect environment anomalies (moisture, temperature, and humidity) and trigger both alerts and possibly initiate corrective actions. Figure 2. Yanmar IoT Smart Greenhouse Diagram shows greenhouse components, including fans, air conditioners, an edge computer, and sensors for temperature, humidity, sunlight, and CO2. This blog post showcased you how you can use AWS Greengrass ML Inference for smart agriculture and smart greenhouse use cases.